A crocheted cactus never needs watering, never dies, and is always in peak condition. 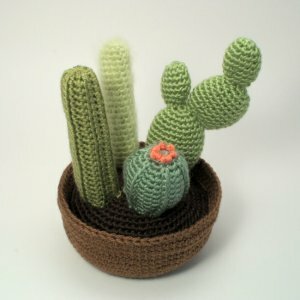 With this collection, you can make 4 different realistic cacti in individual pots, or a beautiful cactus garden arranged in one large crocheted pot. It's the perfect thing to brighten up your window, or to give as an unusual and thoughtful gift. Cactus Collection 2 is an original crochet pattern by June Gilbank, including patterns for 4 different cacti: Micranthocereus, Cephalocereus, Ferocactus (Barrel Cactus), and Opuntia (Paddle Cactus). An individual cactus makes a quick and sweet gift - or you can anthropomorphize it with some eyes and a smiley mouth to make a super-cute version! Two or three (or more) individual cactus pots look great arranged in a line along your windowsill. The larger cactus garden makes a beautiful decoration - and you'll never have that problem where one of the collection dies and you're left with a big empty space in the pot! Details: pattern is 13 pages long and includes over 30 step-by-step photographs and explanations so you can crochet perfect cacti of your own. Yarn: worsted weight yarn in at least one shade of green (cacti), any floral colour (flowers), brown (soil), and any colour you like for the pot. You can mix and match cacti to create your own perfect cacti garden - and take advantage of the huge savings when you buy Cactus Collections 1 & 2 together! And/or you can mix and match the patterns with Succulent Collections 1 & 2 and Succulent Collections 3 & 4 to create your own custom garden. Date Added: 09/22/2016 by Nicola P.
Date Added: 11/12/2013 by Jamie S.
Date Added: 06/13/2012 by Chrisie M.
Date Added: 03/15/2012 by Monica B. Date Added: 11/04/2010 by Judy C.